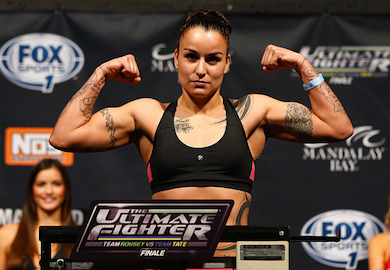 Raquel Pennington and Roxanne Modafferi opened up their fight with contradicting paces. Modafferi was throwing strikes in high volume and was looking to take the fight to the ground, but Pennington was fighting the slow fight by picking her strikes. Roxanne was doing a great job at connecting with leg kicks and jabs, but none of them were harmful. Pennington, on the other hand, was connecting with blows that snapped Modafferi’s head back. At the end of the first round, Pennington rocked Modafferi with a shot that sent her stumbling backwards. Lucky for Modafferi, the horn sounded right after. The action picked up immediately in the second round with Modafferi looking for a takedown, but Pennington defended intelligently. Modafferi actually ended up on her back after failing to take down Pennington, but she made the best of it by almost submitting Pennington twice. Luckily for Pennington, Modafferi was unable to lock up the arm-lock and armbar submission attempts. After getting stood back up, Pennington would get the best of Modafferi. Even though Modafferi was doing well while standing, it was obvious that she needed to take the fight to the ground if she wanted a victory. Modafferi tried to stand her ground in the beginning of round three by connecting with a few punches, but Pennington retaliated with punches that landed twice as hard. At the end of the fight, Pennington locked in a standing guillotine and it looked to wrench painfully on the neck of Modafferi. Modafferi would eventually fall on her back with Pennington in full mount and the guillotine still locked in, but she was saved by the bell.